I took several large meaty leg quarters from the grocery (actually imported, on sale for less than local chickens, but my attraction to them was the size) and generously seasoned them with salt, cracked and whole black peppercorns, bay leaves, thyme and let this marinate in the fridge overnight. For 8 large leg quarters, use roughly 2-3 tablespoons of salt. Yes, it’s a lot, but my first batch was bland, and I realize the chicken needs a lot of salt to achieve a similar result to duck confit. The next day, wipe off the salty marinade and place the leg quarters in a wide palayok or clay cooking vessel. Add the bay leaves. Cover the chicken quarters with top quality lard (or use duck fat if you have it) and place this over a charcoal fire until it just begins to gurgle. You don’t want this to boil, just simmer or gurgle ever so slightly. Manage your coals closely, as the heat can be tricky. Cover and let this cook for say 3-4 hours until the meat is just incredibly tender and succulent. 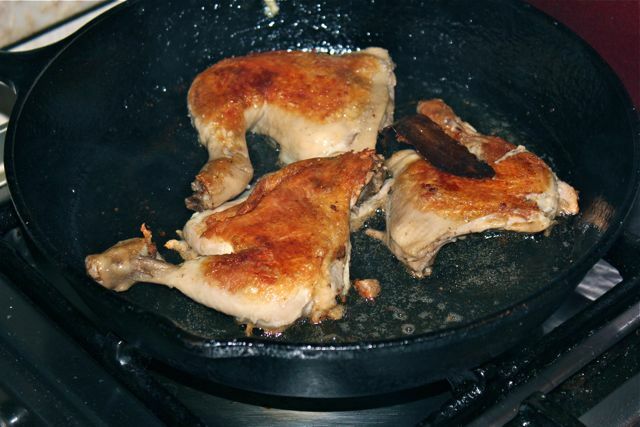 Remove from the fire and you can immediately serve this up by first pan-frying each piece of chicken until golden brown. Or you can cool this down, and store in the fridge for a few days before using. You could also freeze them for weeks or months, I suppose. thanks for the great idea! i’ll try making this with smoked turkey leg for added flavor. can’t wait! MM, as usual another supremo technique and idea…BRAVO! PS: Is that cast iron skillet in the picture? Do you know where to get the Palayok? I have never cooked with clay pot before but I hear it is a great cooking vessel to retain the moisture. Actually confit ‘matures’ with age, just like wine or cheese. This intensifies the flavor, which might really help when using chicken instead of the traditional duck. Keep it in preserving jars or a ceramic or terracotta pot with a good seal and make sure to drain off all juices before covering with fat. Keep in the back of the fridge and just warm the pot in hot water when you want to use some, lift the pieces out and then make sure the rest is well covered with fat before storing again. As long as the confit is always well covered with solid fat, it won’t spoil. I once kept a batch going for nine months and it just kept improving with age. This looks like a great idea for typhoon season food reserve, as a delicious alternative to the usual canned goods. Do you think it will keep without refrigeration once the lard coagulates and seals the chicken parts completely? Papa Ethan, confit used to be stored in cellars or other cold places and would last through the winter (it was traditionally made in autumn when the ducks or geese were slaughtered). However, in a tropical climate I would keep it in the fridge. Also sterilize the containers with boiling water before using. And don’t use plastic, that could affect the taste. something to try soon! 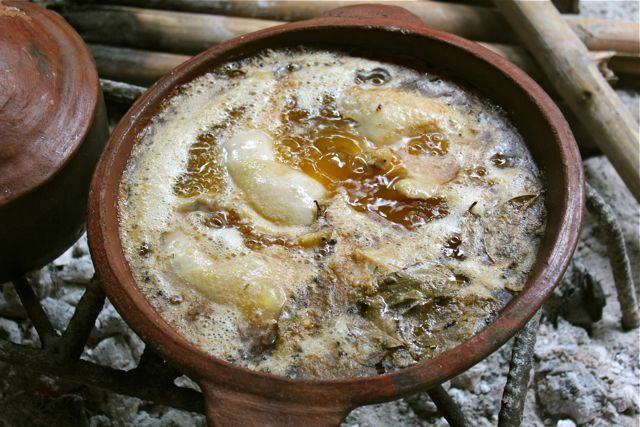 i’ll try to render chicken fat into oil first, same as the chicken oil in bacolod inasal restaurants. Traditional treatment for geese who have given up their livers (albeit, forcibly) to a nobler epicurean goal. Best turkey you will ever cook as long as you have a large pot and ample spot in your fridge. Works equally well with any other mature, tough, dry and cheap fowl, in other words, you do not have to bite the pullet. Following MM, I will try doing a confit …maybe with some native duck, which tend to be lean and on the tough side. Papa Ethan, if you’re going to be serious about doing this, some more tips: sterilize your containers then invert them and let them airdry on a dishrack. Once dry, put a teaspoonful of sea salt in the bottom of the container. This neutralizes/sterilizes any meat juices or sediments which could cause spoilage. Take your confit, (chicken, duck or whatever, pork works well too) out of the fat and drain on a rack. Strain your fat through a very fine sieve. Then ladle some of the fat into your container and allow it to set to semi-solid state. Just solid enough to allow you to put some of your confit pieces in. Try to arrange them flat in one layer, and try not to let them touch the sides of the container. Ladle on some more of the fat and when semi-set add another layer of confit, etc. I’m being finicky because, especially in a hot climate, you have to be sure to prevent food- poisoning etc, but I have to say my longest batch survived an Australian summer at 45C no probs. If you use only a portion, refrigerate the leftovers immediately, covered with the fat. And do check regularly – open the container and sniff. 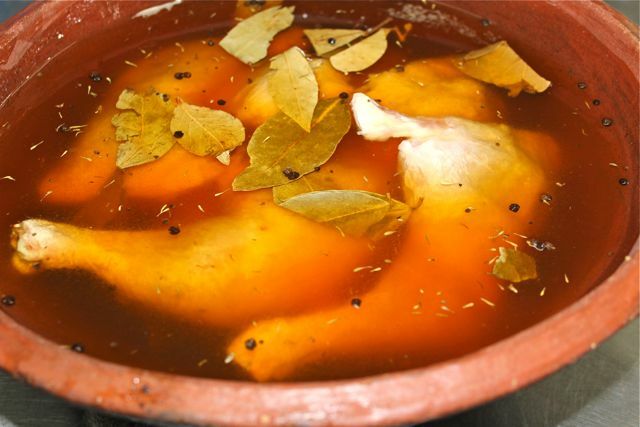 There should be NO unpleasant odors – a well kept confit smells of fresh air! 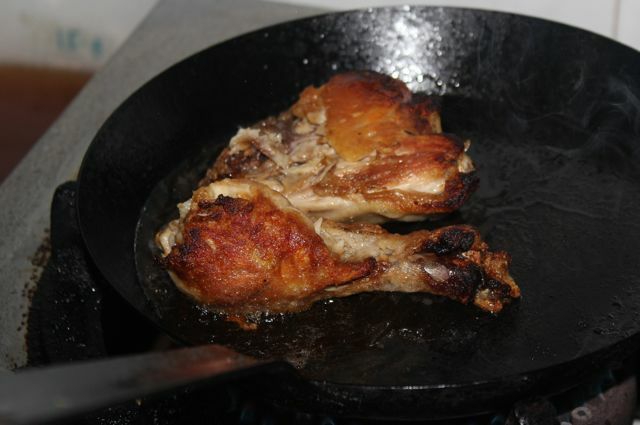 Your black pan in the first picture makes my stomach grumble more than the chicken. :D Is that Lodge? ( green eyes of envy). Love u, MM! Now this is what I have been looking for, I love chicken and this is a nice departure from the old chicken dishes I usually serve up, thanks Marketman!